I could show them to you. Tell everything you see to Beit of Yisrael. No stranger, uncircumcised in heart, nor uncircumcised in flesh, shall enter into My sanctuary, of any stranger that [is] among Benai Yisrael. How can you be in Covenant relation and entry to His Santuary? Be sure you do not miss out any order of the steps. Having Blood Atonment of Yeshua Ha Moshiach - Are you wash by blood of the Lamb? Receiving the Ruach Ha Kodesh (Holy Spirit) - regeneration of our spiritually dead soul back being restored back to Life. Receiving a sign of Circumcision of Flesh (physical Circumcision) - a prove of righteousness of faith. Today salvation comes to you. How do you response? Why is the Millennial Mikdash necessary? It will be for the purpose as a teaching center or school. proper worship during the coming kingdom of Moshiach Yeshua on the earth. The Mikdash is supposed to remind everyone of the substitutionary death of Moshiach Yeshua, as the "Lamb of Elohim," at His first coming some two thousand years earlier. There will still be sinful man and women born during the Millennium period. No Ark of Covenant The Shekinah glory Himself will hover over all the world. Below are the outline of the Ezekiel Mikdash instruction and construction. All the scriptures reference are hyperlinked, click to read the scriptures. You can switch which ever version you prefer. 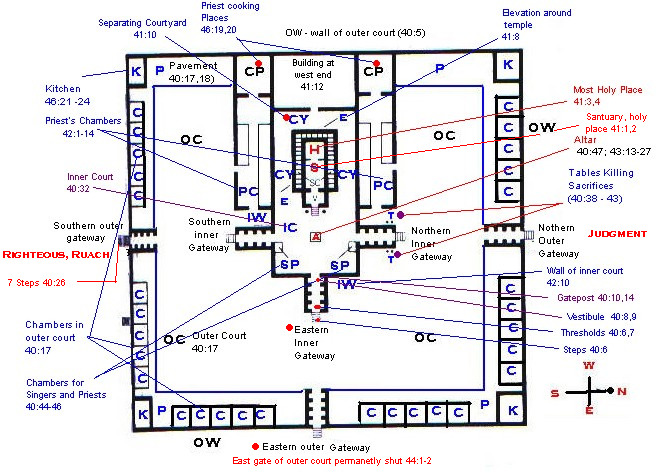 The Other Two Gates of the Outer Court (Chapter 40:20 - 27) gateway facing North is to be like the eastern one, archways design and palm trees. South gate same measurements and structure and no gateway facing west. The Equipment for Sacrifice (Chapter 40:38 - 43) 8 Tables at the vestibule provided at North gateway for animal sacrifices. Northern gateway symbolise Judgment Rev 6:9; 11::1-2. 4 tables of hewn stone will be used for burnt offering. The Vestibule (Porch ~lwa ) of the Mikdash (Chapter 40:48, 49) design similar to Sholomo Mikdash. reminds us that in all service we must build according to YHVH's specification. Precise measurements. The Sanctuary and Most Holy Place (Chapter 41:1 - 4) Similaries: measurements of sanctuary same as Sholomo Mikdash, The same two fold division of the ancient Mikdash apparently will be continued in the Millenial Mikdash. The Kohenims' Quarters (Chapters 42:1 - 14) located both north and south of the Mikdash. Kohanim will eat the most Kadosh offering and a place where they keep their sacred garments for ministering. The Measurements of the Outer Court (Chapters 42:15 - 20) Measurements 500 rods on each of it 4 sides. The distiniction between Holy and common in verse 20 is the difference between what we call sacred and secular. It is difference between worship and the common affairs of everyday life. 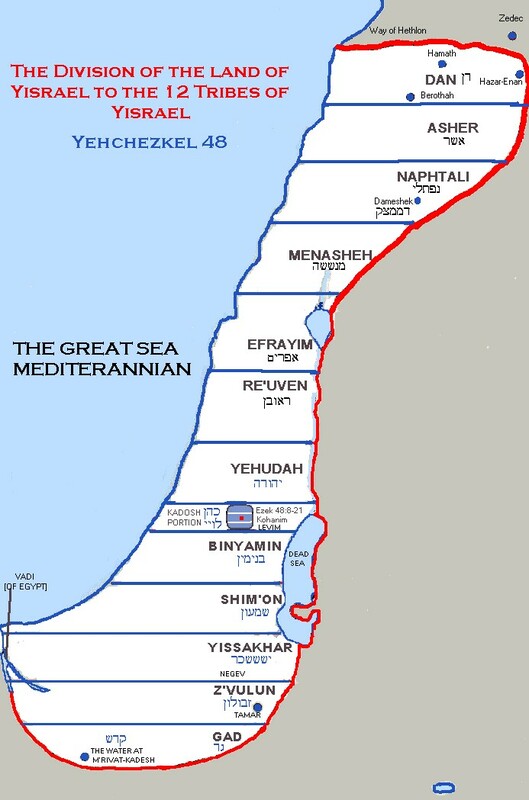 The Division of the Land (Chapter 48) included the map division comparison with Yehoshua 13 -21, Notice the half tribe of Manasheh, Gad and Reuven has crossover to Jordan River. To view the Land Division in Yehoshua's time point on the above map.The Map only cover on Yehoshua 31 - 21 the focus is on the type of First Love, first entry to promised land. And we look forward the everlasting promised. What is the ONEness YHVH? The Manner of Conception - Is YeSHuA YHVH? Who is ADoNaY YeSHuA HaMaSHiaCH? What are the Doctrines of Balaam and idolatry? Learn Hebrew Glossary commonly use in scriptures. How to dealing and choose your Potential Life Partner or intimate in Scriptural conviction? What does the Scripture say about HakHnaSaT OReHYM (Hospitality)? [PDF] Messianic notes Archives One. / Archieves Two This site are save in PDF format, due to the site down quite often. Guard the Unity of the Ruach in the bond of Shalom!